JOHN DUGAN is recorded as having served as an extra man with the Camden Fire Department's Hook & Ladder Company. 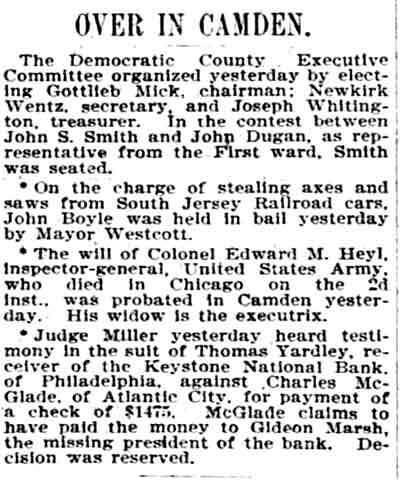 He was appointed on April 8, 1876 replacing Josiah Davis. He served for one year, being replaced in turn by Alexander Wilson in April of 1877. Fire Department records state that John Dugan worked as a watchman and at the time of his appointment was living on Linden Street near Point Street. John Dugan was born in Ireland in May of 1845, according to the 1900 Census. He was living in New Jersey in the late 1860s when he married. His wife Annie bore him a son, William, around 1868. 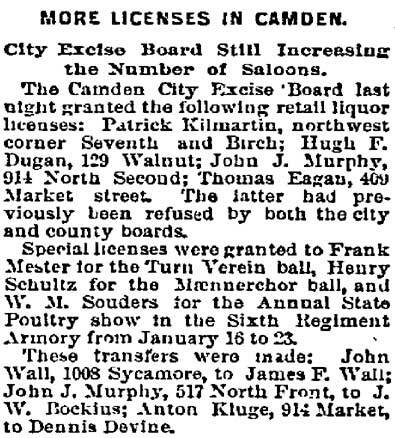 When the Census was taken in Camden's North Ward. 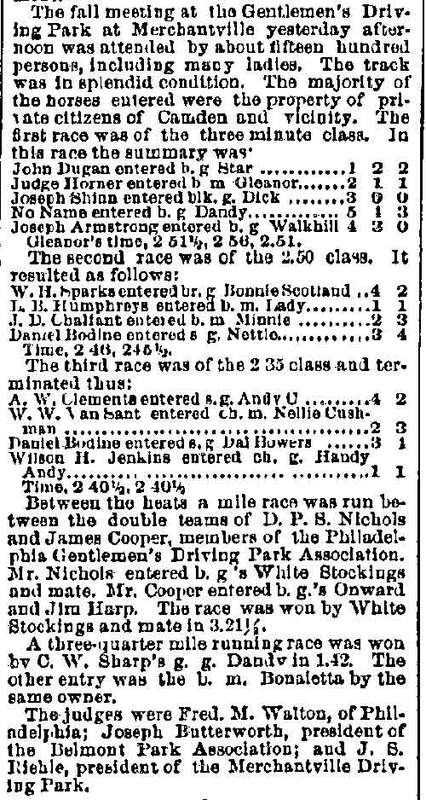 John Dugan appears in the 1870 Census, living in Camden's North Ward, and working as a laborer. Eight more children followed the Census, John Jr., Hugh, Kate, Rebecca, Matthew, James (who sadly died, quite young), James A., and Marie. As stated above, John Dugan was living on Linden Street near Point Street when appointed to the Fire Department in April of 1876. Within the next two years he opened a livery, boarding and exchange stable on North Front Street south of Linden Street. He also bought and sold horses. The 1880 Census shows his address as 102 Linden Street. Also living at 102 Linden Street was Jacob Rettberg and his wife Margaret. 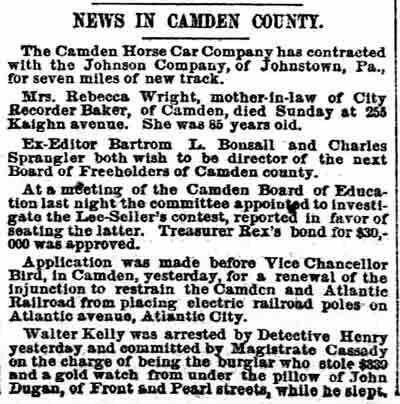 Jacob Rettberg owned a large wagon works on Market Street, and it may well have been with his assistance that John Dugan went into business. In late 1884 or early 1885 John Dugan acquired the building at 100 Pearl Street, a block north from his previous residence, and opened a saloon, or, to use the parlance of the times, a hotel. This would be the Dugan family's address through at least 1900. John Dugan operated both business as late as 1893. By the latter half of 1894 he had divested himself of the livery, and concentrated on the bar business. 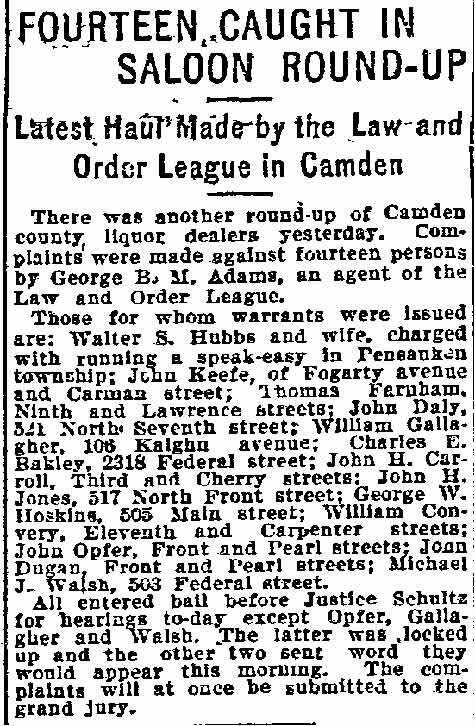 His son, Hugh F. Dugan, operated a bar at 129 Walnut Street in the 1890s. John Dugan was active in local politics as a Democrat in the 1890s. 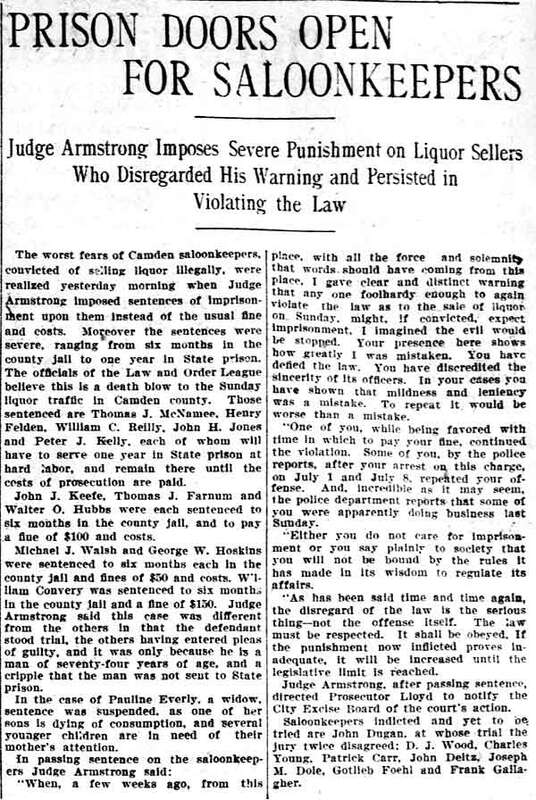 He was still in the bar business and living at 100 Pearl Street when the 1900 Census was taken. Living at 100 Pearl Street at that time were John and Annie Dugan, sons Hugh, Robert, Matthew, and James A., daughter Mary G., daughter-in-law Catherine and Julia, and granddaughters Helen and Regina Dugan. 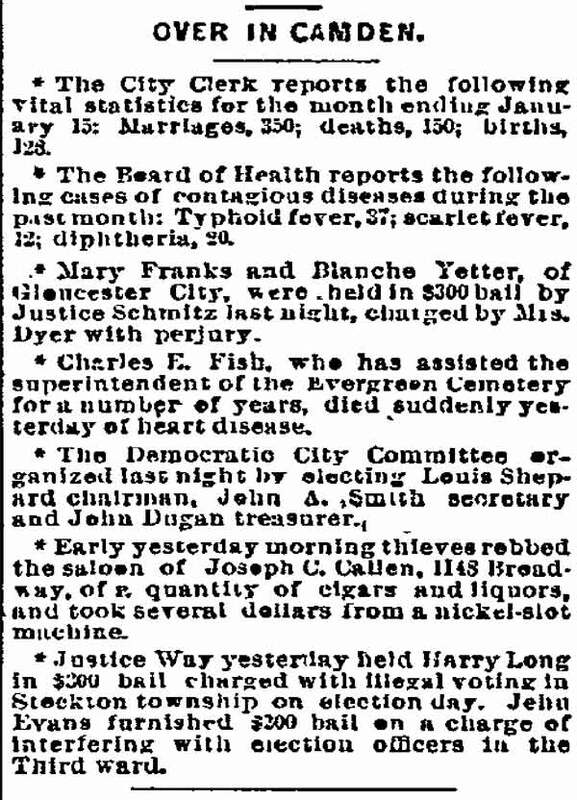 Annie Dugan died not long afterwards, and son James A. Dugan passed in 1903. John Dugan seems to have retired by 1906, when the City Directory only states an address, 106 North 2nd Street. 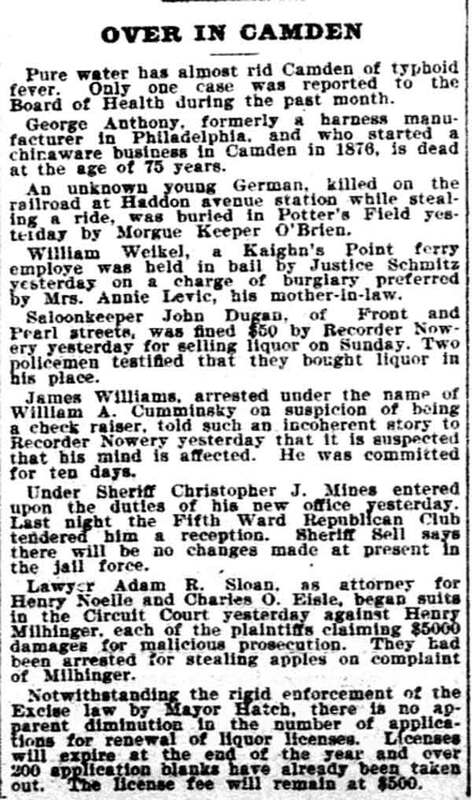 Son Hugh F. Dugan, who owned and operated a successful establishment, the Avenue Hotel, at 6 Delaware Avenue in Philadelphia, passed away in 1908. 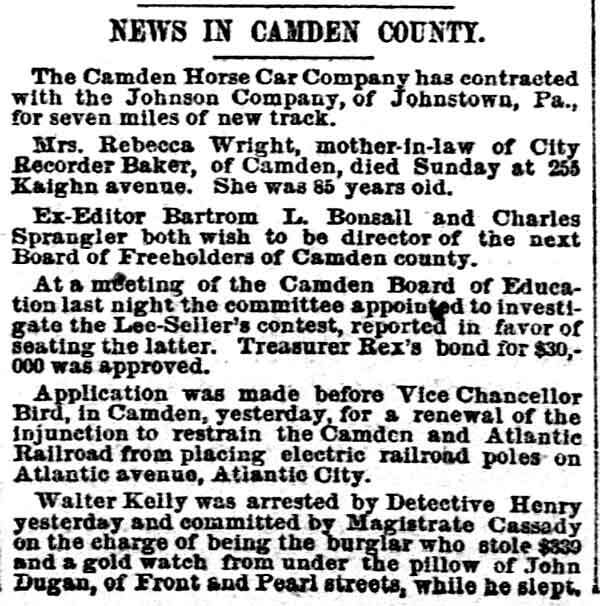 John Dugan and his family were gone from Camden, either having moved or died, by the time the 1910 Census was taken. John Dugan's son Robert and daughter Marie had moved to Philadelphia by that time. 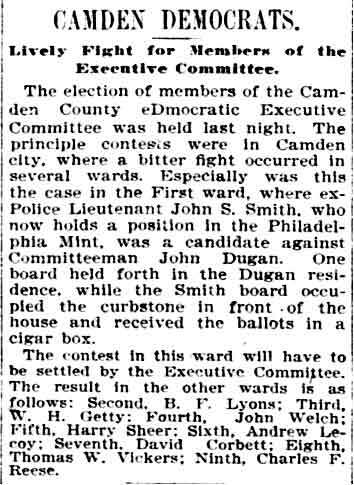 John Dugan was not related to John F. Dugan, who served with the Camden Fire Department many years after the John Dugan family had left Camden. John Dugan and son Robert are taking in the sights at Washington.